People pass by brothels in the prostitution district of Magane-cho (真金町) in Yokohama. Signs advertise alcohol and tobacco. 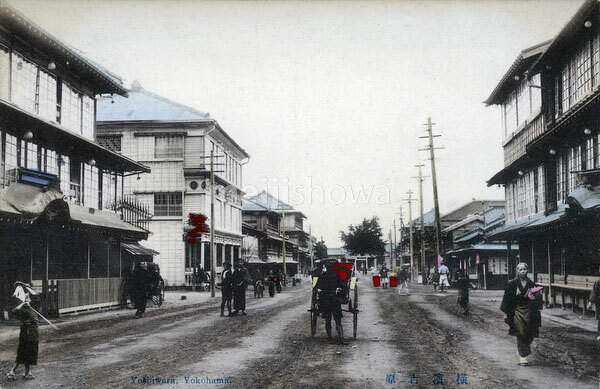 In 1908 (Meiji 41), Magane-cho counted 33 brothels, while nearby Eiraku-cho (永楽町) had 34. A total of 1,400 prostitutes worked here. By the late 1910s, the number of brothels had risen to over 80, employing more than 1,800 women.